Oakville Transit is going to be launching a program that allows transit users to simply glance at the bus stop and see a large Outdoor Digital Signage that will show you the bus times and any other pertinent information about your bus. Oakville Transit wanted to ensure its riders had that information to communicate next bus time arrivals and other relevant information about Oakville transit. Placing the Outdoor Digital Signage Kiosk at the bus stop was the ideal solution to have real-time accurate bus arrival time. Having real time information is essential for most individuals especially when you’re relying on important services like public transportation. Remember back in the days when you wanted to find out the arrival of your next bus time? It was the most unpleasant experience; you would have to call your local bus office. A slow and annoying computer generated voice automated attendant would answer the call and say, “your next bus (PAUSE) is coming (PAUSE) 17 MINUTES. Thank (PAUSE) You. Have a (Pause) nice day” Please kill me know. In this article we’ll explain how we did it and what challenges we had to overcome. Oakville transit is an organization that is responsible for providing public transit to citizens within the Town of Oakville. Creating a positive experience for bus riders is their main objective. This is especially true for key destinations such as the new Oakville Trafalgar General Hospital in north Oakville. Oakville Transits main objective was to communicate accurate bus arrival times to the customers, and also display the times of the bus schedule as well as adjusting arrival time updates according to varying weather conditions. Therefore, predict a more accurate arrival time for the bus riders. One of our challenges was finding an outdoor screen that is bright enough to compete against bright sunlight. We overcame this challenge by using a high bright screen, which has 2500 Nits display. To give you some scale and perspective, typical indoor screen is usually 350 nits. This is hard to see in an office or lobby with lots of windows on a bright day. This high bright screen provided us with the opportunity to clearly see the display on screen on a sunny day. The outdoor enclosure provides us with the ability to protect all the electronics under undesirable conditions like rain dust and varying temperatures so that it doesn’t affect the performance of the components inside of the digital signage kiosk. The other challenge we had was getting and updating the real-time bus schedule from their database. Oakville Transit’s uses Clever devices which provides innovative technology such as BusTime® , a real-time data of bus arrivals platform. Once our engineers understood how the API worked to extracted data we’re able to build a conduit to stream that data directly into Outdoor digital signage kiosk software. As a result, we were able to display the schedule in real-time. The Town of Oakville did not want to use the hospital network, and instead wanted to be independent. Our different solutions for the problem didn’t have a feasible approach. Therefore we opted to use wireless data provided by Rogers wireless. Thus, we provided each outdoor digital signage kiosk with a mobile hot spot, which gave us the ability to securely connect each device to a reliable data source. 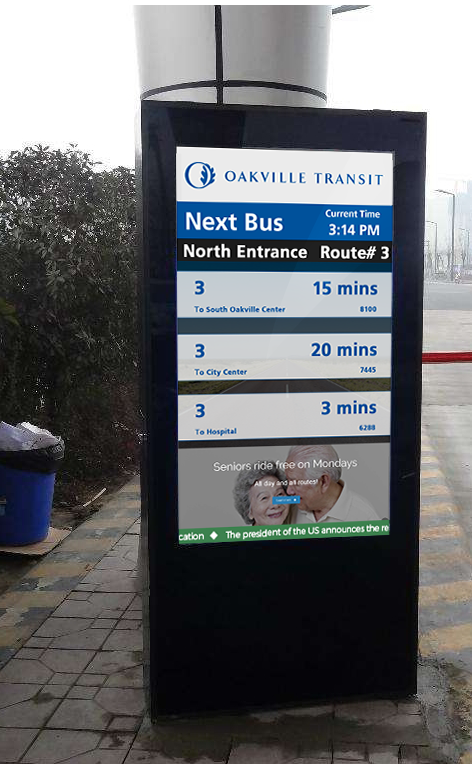 The final outcome was Oakville Transit customers are now able to see real time bus schedules at each of hospital entrance. In addition, Oakville transit can now communicate to its bus riders about weather changes and therefore predict and display the accurate arrival times.